I've been getting an issue with FFXI where it keeps DCing every 5 to 30 minutes. When I got annoyed and looked what was happening with a network monitor it says something like TCP:[Segment Lost]. Usually that "Segment Lost" thing isn't there. Only during the DC. My biggest problem though is I don't know what that means, nor do I know how to fix it. It only happens with FFXI, nothing else. I am able to play on my phones hotspot without a problem, but it's slow and having to change networks every time I want to do something else it horrible and annoying. Any help would be appreciated and I can provide more information as needed. Edit: To elaborate more. It just shows the symbol above my head randomly, even though Sending and Receiving are still normal. This just kinda stays there with normal S&R til it eventually gives me error 4001 and 0250. 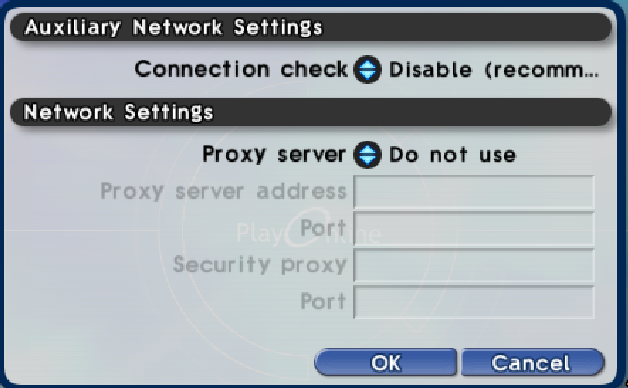 I had that problem too, when you log in, you need to go to network settings on POL viewer, and select the option for faster internet. Atleast that was my issue, because I have gigspeed, it couldnt handle it without the setting selected. Unfortunately I don't see an option such as that. The options I get when clicking network options are as follows. I'll get random connection lost. No d/c or anything just goes right to the error screen and then to the relog screen. Happens at least a couple times an evening. I think its something on their end, two different pc's and it happens on both but different times. if you randomly get the slow d/c with disconect icon on your head and game just poops after "x" time with connection lost or no response from server message. happened to me few years back when i gota new modem/router from isp it had no ports open or plug n play auto open. I had todo it manually and it fixed my "slow" d/c issue after random time. Yeah same issue here for 2 months. Turned out my service provider had a dip (they physically had to investigate) turned out they had to turn off the Comcast firewall with my new modem issue resolved. I’d recommend having your internet provider come out physically looking for dips. It really shouldn't be difficult to see where the drop occurs with any decent scanning software. As it happens to a lot of people but not all the issue is most likely with the ISPs. This exact same thing is happening to me, and also my brother who lives in the same area. Would you be willing to say what area you live in and who your ISP is? For us it has only been happening since the August update or so, and even weirder still, when I dualbox, often times it only happens to one character and not the other. Curious indeed. Edit: Soon I'll be looking into other options like port forwarding and VPN clients to see if they might help. I'll re-post here if I find anything helpful. Just to restate, my problem is identical to that of the OP, not just similar. Doesn't disconnect from discord, always slow D/C, doesn't even kick me from both characters. My issue has also been occurring for the last 2 months or so. I think either we live in the same area with the same ISP, or another possibility is that there is simply a problem that requires a failure on both ends, and we are the lucky winners. At any rate, these problems seem too similar to be pure coincidence. All D/C at fairly short intervals, all slow D/Cs, all only from FF, all only affecting one character at a time, and all starting a couple months ago... I'd say there's certainly something on the server side that at least contributes to or exacerbates the issue. Yeh mine was happening from August but mine was an issue as the isp told me, “something to do with my comcast firewall.” They turned it off 0 issues now. Update, the problem has been fixed. Can post a CSV and tell you the packets where it died if you still want to look at them lol. However simply enabling that "Connection Check" actually fixed my problem here.But yeah if anyone wants to look into an actual reason rather than just clicking button for fixes I'll post the CSV, just let me know. The connection check button also fixed my problem. Rather strange, not sure what that function actually does, but whatever it is, it worked. I even left it on for 2 days and it hasn't disconnected anymore.